The Bangor Daily News is reporting that the new owner of the Montreal, Maine and Atlantic will change the railway's name to the Central Maine and Quebec Railway once the deal closes, probably by the end of March. The excellent Oil-Electric blog has a good history of the rail line. He raises the interesting question of what power will operate the railway, given that the MMA is selling 25 locomotives to raise money. Perhaps the CM and Q will lease locomotives to start. or perhaps they have no intention of actually operating This filing to the Surface Transportation Board asks for an exemption for a non-rail company to own the CM and Q and operate essentially the same routes and serve the same customers as the MMA. Speculation on the cause of the Lac-Mégantic runaway has focused on an insufficient number of hand brakes being set on the locomotives and freight cars (I thought that too). It has come to light that the MMA was repeatedly warned about not setting enough brakes - in 2004, 2009, 2011 and 2012. I have a number of comments I'd like to make about Transport Canada's effectiveness, but that will have to wait for another time. 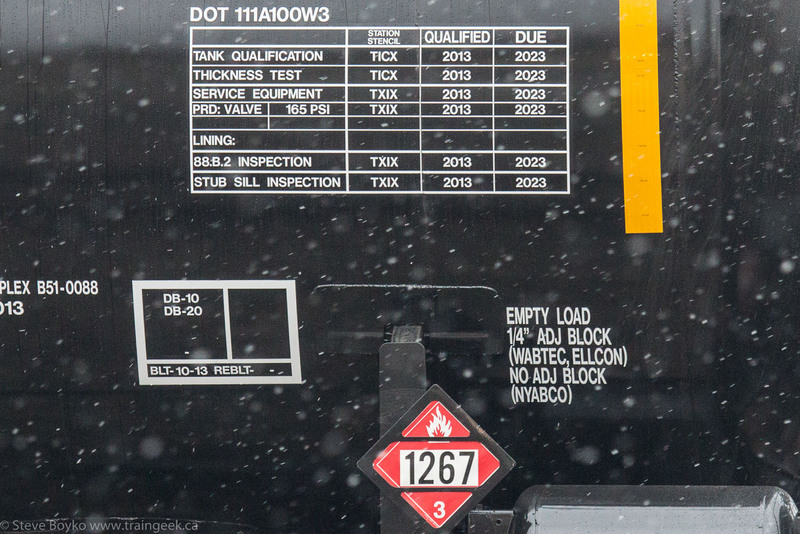 Meanwhile, Transport Canada is calling for increased tank car safety (but not requiring it) and Irving Oil is voluntarily upgrading the DOT-111 cars in its tank car fleet for increased protection. I'm told that they had a backlog of cars in Saint John due to difficulties with unloading in the cold temperatures, but the backlog is almost clear now. As non-upgraded DOT-111 cars are emptied, they will be shipped off to be upgraded. EDIT: Added STB link, thank you JHansen! Following last week's announcement that the provincial government would invest in most of the northern New Brunswick CN track, but leave the Bathurst-Miramichi segment out, opposition is growing to the government's plan. Members of Parliament Yvon Godin (NDP, Acadie-Bathurst) and Dominic LeBlanc (Liberal, Beasejour) are both opposed to the government plan, according to this CBC article. The other eight MPs, coincidentally all Conservatives, have not said anything on this issue that I am aware of. I'm especially curious what Tilly O'Neill-Gordon, MP for Miramichi, has to say on the matter, and I have emailed her to ask. Some accuse VIA Rail of "deliberately attempting to discourage ridership". Ted Bartlett, acting president of Transport Action Atlantic says that VIA's decision to cut the Ocean back to three trips/week and VIA's lack of marketing have led to reduced ridership (almost precisely half what they were prior to the cut, according to some accounts), and the recent CN-New Brunswick announcement "has presented VIA with a golden opportunity to get out of a service that they really don't want to operate." Revive Industrial Rail Services in Moncton. CN has said that it would cost $10 million to restore the missing segment from Bathurst to Miramichi. A "spokesperson from Economic Development" (presumably the New Brunswick government) was quoted as saying it would cost $50 million to reroute the Ocean over the Edmundston-Moncton line. The cost to VIA was said to include the cost of buying land, building at least 5 stations, and installing signals. That cost sounds high to me but it would have to be studied and probably is being studied by VIA Rail. I understand that VIA Rail does not have $10 million to spend on the Bathurst-Miramichi segment. Their budget has been squeezed by the federal government for the past few years and extra cash cannot be found. I believe the federal government needs to step in and provide this capital cost to upgrade the line and retain service, just as they have stepped in to join provincial governments for a rail underpass in Winnipeg ($22.2m), rail widening in the Greater Toronto Area ($8.3m), port upgrades at Belledune ($26.4m, jeopardized by the soon to be very long rail connection to the rest of the world), rail upgrades for NB Southern ($9m), and on and on... the federal government needs to come to the table. The Minister of Transport, Lisa Raitt (Conservative, Halton), has been ducking this challenge. She spoke on February 3 to the Canadian Club of Ottawa as the Minister, and her notes contain not one word about VIA Rail. When asked by MP Bruce Hyer (Green, Thunder Bay-Superior North) about the future of passenger rail in New Brunswick and Sault Ste. Marie (also in jeopardy), she said, "We are monitoring closely. We are working with VIA Rail and with everybody who has an interest in these lines to get to the right place. That said, it is incredibly important to note that VIA Rail is an arm's-length corporation that makes its own business decisions." With respect to the honourable minister, at the end of the day, VIA Rail answers to the federal government. They might be at arm's length but it is the federal government's arm that holds them accountable. Time to step up. Write your Member of Parliament. Contact the Minister of Transportation. Get involved and make some noise, or this rail line will be gone forever.